We love it when country stars step forward to help out a great cause! 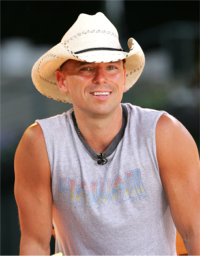 Kenny Chesney has established the "Spread the Love Fund" to help victims of the Boston Marathon bombings get the help they need. The fund will work with Boston Medical Center to help pay for prosthetics as well as the ongoing care and physical therapy the victims will require. Additionally, all proceeds from the download sales of Chesney's song, "Spread The Love," will go to the fund. The song was co-written and recorded with The Wailers and appears on Kenny's new album, Life on a Rock, which was released yesterday. Chesney says, "It's hard to imagine a world where taking your children to school, going to the movies or witnessing something as iconic as the Boston Marathon is a dangerous thing to do. For me, I want to help give these people as much of their lives back as possible, but I'd also like to counteract some of the negativity in the world . . . Remind people that there are more good people out there, and it’s up to us to 'Spread the Love.'"